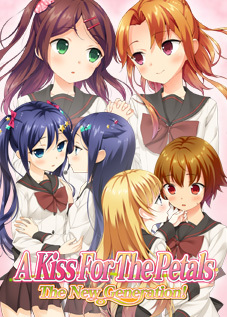 A Kiss For The Petals – Remembering How We Met is available in English now for Windows, OS X, and Linux from MangaGamer at MangaGamer.com and Steam. 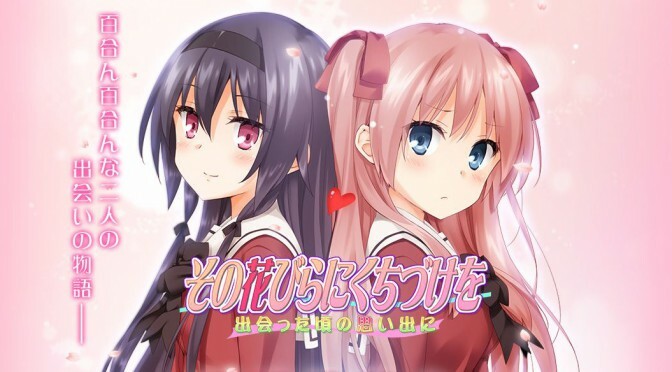 The second product of St. Michael Girls’ School, A Kiss For The Petals – Remembering How We Met (その花びらにくちづけを　出逢った頃の思い出に Sono Hanabira ni Kuchizuke wo – Deatta Koro no Omoide ni, lit. “For a recollection of the time we met”) is a release exclusively for iOS and Android devices, a first for the series, featuring Risa and Miya. It was illustrated by Peko and written by JUN, as in the Yurin Yurin releases. The price is 500 yen on Android and 600 yen on iOS. 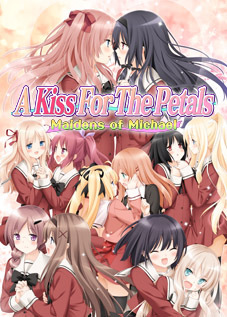 At Anime Expo on 4 July 2015, software publisher MangaGamer (website is not safe for work) announced an exclusive partnership with St. Michael Girls’ School to release their products in English in their panel. The first product to be released is a home computer conversion of A Kiss For The Petals – Remembering How We Met on the Steam service. No release date or price for this new version has been announced. Additionally, St. Michael Girls’ School announced a Twitter giveaway and a “review campaign” similar to the Twitter follower campaign for their own account. Story and and character information has been translated by Ralen. The story follows the conclusion of Risa and Miya’s storyline from A Kiss For The Petals – Snow White’s Knight. The season is fall… as the uniforms transition from summer to winter garments, Risa suddenly has a pang of nostalgia. It was this very uniform she was wearing on her first day at St. Michael’s… The day she met her future girlfriend Miya. Now the two of them share a passionate life as a couple living in Risa’s apartment, but there was a time in their relationship when the very sight of one another would be enough to set off an endless bout of arguing. From Risa’s point of view, it all started with her just trying to get Miya to come to class… And even now with the two of them going out, the chronically truant girl has failed to mend her ways. Remembering those days elicits a faint laugh from Risa. Miya, sitting alongside her, questions Risa’s sudden outburst with a puzzled expression. Class Representative of the Year 2 “Snow” class, she currently lives with her girlfriend and classmate, Miya. She has a studious and hardworking personality. Risa’s girlfriend and classmate in the Year 2 “Snow” class. One of the brightest minds on campus, and although still not terribly sociable, she has started to become more outgoing through her interactions as a member of the St. Michael’s Best Couples. 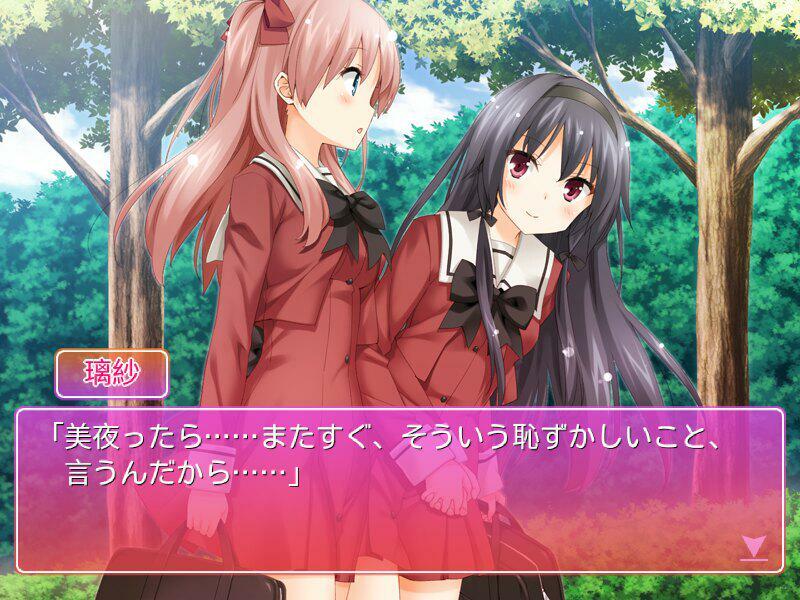 Peko was asked about this visual novel in an interview question in Dengeki Hime‘s December 2014 issue. This will be a story that shows Risa and Miya’s first encounter. The moe points this time are going to be scenes where they have confusing, less-than-romantic feelings for one another as they both come to be aware of each other, so you should definitely look forward to that. On the day of release, St. Michael Girls’ School announced a Twitter giveaway and a review campaign. By following @mikajyo_info and retweeting this tweet, Twitter followers can enter to win an autographed piece of original artwork by Peko. As a result of my letter being read on the Anzu Hana Tendonitis Santa Special, I can confirm that St. Michael Girls’ School is able to ship internationally. The contest ends on 27 March. On Android, the app is a free trial including a small portion of the story and requires an initial download. The full version is provided as an in-app purchase and initiates an additional download, totaling approximately 300 MB of data to the SD card. No free version is available for iOS. I was able to download and upgrade the Android version with my USA-based Google account without issue. Currency conversions are calculated on purchase of the in-app upgrade; the price for me was $3.80 USD as of this writing. However, the iOS version requires a Japanese Apple ID to download, which requires a Japanese credit card or Japanese gift cards to add funds. Instructions are available to change an existing account’s region or to create a new account for the Japanese store. Gift cards will be sufficient to download the app. YuriBook Pro recommends Japan Codes for obtaining them, but at this time, many of the lower denominations are out of stock. Nihongo Pera Pera also sells Japanese gift cards, but at a higher price. As a release for mobile phones, it contains no adult content, although the app is classified at the highest maturity ratings available, so accounts restricted by parental controls may not be able to access them. 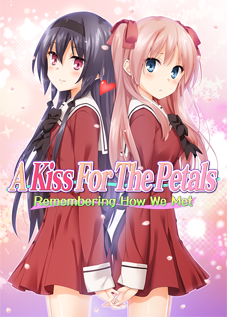 A Kiss For The Petals – Remembering How We Met is available now for iOS and Android. Unfortunately, this will not be possible unless the data structures of the mobile app are extracted and documented. Ahh thats a shame! Well is there any updates on the other games? Also will there be any Risa and Miya games translated? It is site policy not to provide updates on translations on request.